On May 8, 2009, Ronald Cordell Sims became the Deputy Secretary of the U.S. Department of Housing and Urban Development. Sims now second-in-command of the federal agency will oversee day-to-day operations of the Department which has an annual budget of $39 billion and some 8,500 employees. A long time champion of environmental stewardship and mass transit, he will now confront the national foreclosure crisis among other housing issues. Ronald C. Sims, a twin, was born on July 5, 1948, in Spokane, Washington, to James M. Sims and Lydia T. Ramsey Sims. During World War II his parents had moved from Newark, New Jersey, to Spokane’s Geiger Air Field, where his father served in Army Air Force. After graduating from Lewis and Clark High School in 1966, Sims attended Central Washington State College (now Central Washington University). While in college he became politically engaged as a columnist for the student newspaper. He wrote articles that challenged many of the policies of school officials. His activism contributed to his election as vice president of the student body in his junior year, and in his final year of college, the student body president. Sims graduated from college in 1971 with a bachelor’s degree in psychology and then moved to Seattle. He held a series of local, state, and federal government positions. His first position was as an investigator with the consumer-protection division of the Washington State Attorney’s office. Later he held a similar post with the Federal Trade Commission. In 1979 he became the manager of youth services for the City of Seattle’s Department of Human Resources. Sims later became the director of the South East Effective Development (SEED), a community based organization that advocated economic development and social justice in southeast Seattle. Ron Sims began his political career in 1985 when he became the first African American elected to the King County Council. While on the Council, Sims promoted civil rights issues including lobbying for the renaming of King County in honor of Dr. Martin Luther King, Jr. Sims also promoted computerizing the police fingerprint identification system, building a transit tunnel through downtown Seattle, and improving intergovernmental collaboration. Sims’s political success contributed to his reelection election to a second term on the Council in 1989. He ran unopposed in 1993 for his final third term. One year later Sims won the Democratic nomination for the U.S. Senate but was defeated by Republican incumbent Slade Gorton. 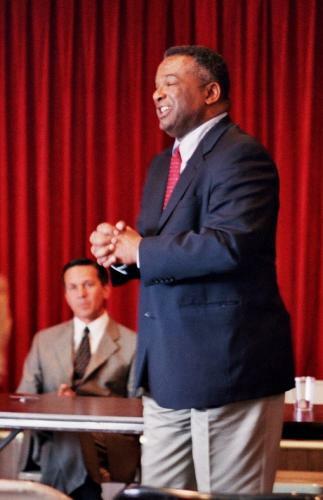 After King County Executive Gary Locke won the governorship, Sims was appointed to Locke’s vacant position in November 1996. Sims then ran for County Executive the following year, beating Republican Suzette Cooke. He was reelected in 2001 and 2005. During Sims’s tenure, King County government improved mass transit and water quality, and addressed environmental issues. In 2004 Sims was defeated by Washington Attorney General Christine Gregoire for the Democratic nomination for Governor. Gregoire went on to narrowly win the governorship over Republican Dino Rossi. In recent years, under Sims’s leadership, King County has promoted AIDS awareness and other public health issues. Sims, an ordained Baptist minister, has continued his community involvement as a member of “Night Watch,” a ministry dedicated to helping the homeless. Sims and his wife, Cayan Topacio, have three sons.